Eliminates wear from up-and-down friction movement of trailers loading and unloading. Wedge Anchors used to attach dock bumpers to concrete surface are sold separately, please click here for more information. 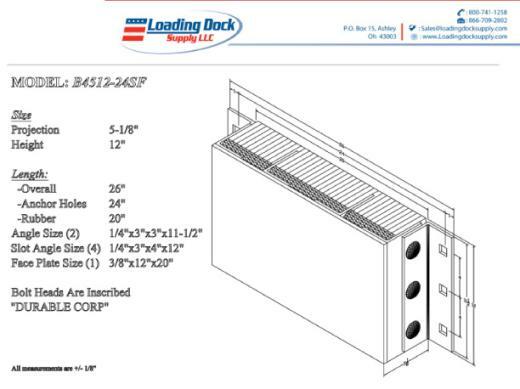 Furnish and install rubber dock bumpers as manufactured by Durable Corporation. Model No(s)______. Resilient rubber material of bumpers shall be rubberized-fabric truck tires cut to uniform size pads and punched to receive 3/4" supporting rods. All bumpers must be 5 1/4" thick (projection from dock), and closed with two 3" x 3" x 1/4" structural angles under approximately 1,500 lbs of pressure. The angles are welded to 3/4" rods at one end and closed with threaded rod and nut at the other end.